Join the discussion on our forums! Come discuss Lucentbark over in our dedicated Lucentbark discussion topic. Taunt. Deathrattle: Go dormant. Restore 5 Health to awaken this minion. Always feels refreshed after a little dirt nap. As a priest, trying out a deck with Zerek, Master Cloner but no Catrina Muerte, faced a druid using this. Used Silence on Lucentbark, copied it with Seance, 2x Shadowy Figure, Coin, Power Word: Replicate. Looks like it doesn't have to be 5 all at once, or even on the same turn. Some lifesteal shenanigans might help heal druid. Is that gonna be a thing now? Heal Druid? You just need to copy this thing several times. Maybe Gloop Sprayer will see some play. Kripp, while reviewing this, said it will probably have a huge synergy with da'undatakah. I don't believe so, though. It's deathrattle should be "go dormant" only, right? 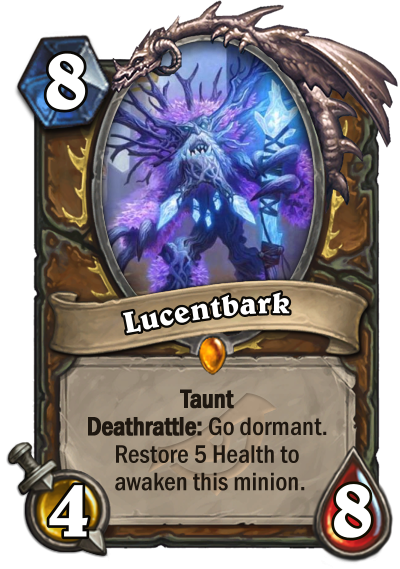 It will create a dormant Lucentbark, similar to how Sherazin works. So you can revive it after and have two Lucentbarks every time you heal for five. Way too slow for competitive play though. Well. You play this, then you play Flobbidinous Floop and Faceless Manipulatorand then you heal something for 5 now and then... seems OP. A silence can wreck this pretty easily, but that is the smaller issue: we need 5 healing. Does Druid currently have enough heal cards for you to want to play? The driad spell, the new 1 mana choose one spell, Ziliax? Do we have more? Maybe Ancient of Lore? Is this enough? I'm not sure. The way it's worded, at least as far as I understand since I have yet to see any game play footage, it will revive on 5 healing since its destruction, not on a single heal for 5 or more. Our former dormant minions have shown that if there is more detail, it is in the description, such as casting 4 cards 'in a turn' and so forth. So, yeah, if it was 5 healing all at once, I'd say Druid has plenty enough cards, but if it's as I'm seeing it, then bloody hell does Druid have more than enough cards. Yeah, this will be a scary one, especially to duplicate. Side? I am on nobody's side, because nobody is on my side, little orc.